This post is about the most popular Persian food and how to eat Persian food when travelling in Iran. Persian food is one of my favourite cuisines in the world. Years ago, when I was still a small child and I never even heard of Iran, our family was invited for dinner by an Iranian family. I never forgot that evening. We had such a great time and the Persian food was delicious. Unfortunately, living in the Netherlands, I got very few opportunities to taste home cooked Persian food again. When I booked my trip to Iran I was really looking forward to Persian food. Persian cuisine in Iran itself was even better than I expected, even tough the most popular Persian food was not always easy to find as a tourist. My first day in Iran I was honestly a bit disappointed. There were fast food restaurants all over the place serving either kebab or chicken and fries. Not too bad for a quick and cheap lunch, but where were all these delicious Persian stews and delicacies? The secret is that the best restaurants don’t need advertising and are sometimes hidden behind non descriptive doors, in cellars or the back of dark alleys. Iranians know where to go and will be happy to show you where their favourite restaurants are and what their most popular Persian food is. 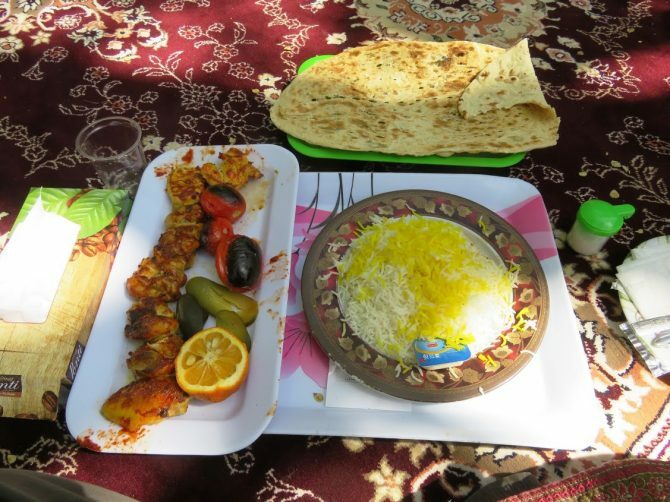 Persian food is delicious and can be an essential part of your experience when travelling to Iran. I wrote this Persian food guide to make sure you don’t miss out on what Persian cuisine has to offer and that you know how to eat Persian food in the proper way. My first morning in Iran I had a hard time finding a place for breakfast. Things in Iran don’t open up early. Luckily breakfast is included in most hotels and otherwise your best bet is to go to a local bakery to buy some fresh bread. The traditional Iranian breakfast is fresh bread, some white cheese and herbs on the side and a cup of tea. That first morning in Tabriz when I was hungry and looking for some breakfast a friendly Iranian helped me out by showing me the nearest local bakery. Iran is still full of traditional bakeries, called noonvah, where every morning bread is served fresh from the oven. The best noonvah are extremely busy and people struggle to get that fresh loaf of bread in their hands. Lines are non-existent, but if you are a foreigner you will likely catch the bakers attention. They might all look like white flatbread loaves to us, but there is a wide variety in types available. Barbari: A long elongated shape of thick and fluffy soft dough with sesame seeds on top. My favourite bread in Iran. Sangak: This rectangular whole wheat bread is still baked the traditional way on river stones. Taftun: Round shaped soft bread made with milk, yoghurt and eggs. Shirmal: slightly sweet round breads flavoured with saffron. Honestly, I did not try this, but it is one of Iran’s most traditional breakfasts. A soup made out of sheep’s head and hooves. Iranians eat it in the very early morning around 5 am before they go to work. There are special restaurants opening up at this hour of the day serving this delicacy. To get an idea of how popular these restaurants are and how it looks like, you can see this short Youtube movie. My favourite lunch dish in Iran was Dizi, also called Abgoosht. It is a stew of lamb meat with chickpeas and potatoes served in an earthenware pot with a stamper, a bowl and bread on the side. First you pour the liquid in the bowl, tear off pieces of the bread and mix it together. because the liquid cools down pretty quickly you eat this first. Make sure you leave some bread for the next step when the stamper comes into view. You mash what is left in the pot, scoop it in the bowl and eat it with the rest of your bread. They often serve it with a big chunk of fat that gives a great flavour to the stew. I noticed that in some of the restaurants that are more geared towards tourists they leave this out. Traditional tea houses often serve the best abgoosht, but are a men’s affair and not the best place to go to as a solo female traveller. If you are in the bazaar be on the look out for the earthenware pots as a sign they are serving abgoosht. In Tehran the best place to eat abgoosht is Dizi Sara. Prices range between 80,000 in a teahouse to 500,000 rials in a restaurant for tourists. Another favourite lunch was Asht-e Reshteh. A noodle soup with fresh herbs and beans. Most bazaars have places where they serve asht for lunch and it is on the menu of some restaurants. The best Asht I had was in Masouleh where most restaurants were serving both asht-e reshteh and some sort of yoghurt soup. Inside the tomb of Hafiz in Shiraz is also a restaurant serving delicious Asht, so it is best to plan your visit to the tomb during lunch time. This vegetable soup made out of herbs is a speciality of Yazd. Yazdi’s might ask you:”Shuli khordi?”, Did you try shuli ? My advice is that you should. The Orient hotel serves shuli and it is a great soup to eat before your meal. Don’t leave Yazd without trying it. Chelo kebab: chelo is steamed fluffy saffron flavoured rice served with any of the kebabs below. Kebab koobideh: the most famous kebab in Iran and what they will most likely serve you as a foreigner ordering kebab without specifying what type you want. Koobideh is lamb, beef or chicken mixed with onions placed on a flat stone and mashed with a wooden pallet. Joujeh kebab: barbecued chicken with olive oil, tomatoes and saffron. This was one of my favourites in Iran. Kebab Barg: I was only introduced to Kebab Barg after I came back from Iran, but I wish I knew about this kebab before. It is a thin barbecued meat of beef tenderloins with onions, saffron and olive oil. Liver kebab: Kebab made from liver (jigar). Absolutely delicious. For the more adventurous foodies, there is also kebab made of beef heart (del), kidneys (gholve), and pure fat. The kebab stores under the Amir Chakmakh complex in Yazd serve it all. In Iran you will eat a lot of rice. Luckily Iranians have perfected the art of making it. Rice is often flavoured with saffron and served with some butter. Iranians love it when the bottom is crispy. It is called Tahdiq and considered to be the best part of the rice. Some even make potato Tahdiq by adding a layer of sliced potatoes at the bottom of the pan. Iran’s best rice dish is Tahcheen. Rice is mixed with yoghurt, eggs, saffron and chicken and then baked in the oven. The best Tahcheen can be found in Moslem restaurant in Tehran’s bazaar. The Tahjeen in Moslem restaurant is served with zereshk pollo. Rice with barberries on top. They give off a slightly sour taste and many Iranians love them. Fesendjoon is my number one favourite food of Iran. Unfortunately it is hard to find on a restaurant menu. It’s a complicated stew of walnuts, chicken and pomegranate syrup made for special occasions at home. After several failed attempts I finally mastered the art of making fesendjoon myself, but it comes nowhere near the fesendjoon I ate in Iran. My advice is that if you are lucky to find it on the menu, you should order it. It doesn’t look very good, but it is absolutely delicious. The best fesendjoon I had was at Ehsan house in Kashan and the Orient Hostel in Yazd. Gormeh Sabzi is another Iranian dish that does not look like it is any good, but is a delicious hearty stew of herbs, beans and lamb meat. I really love it, but it has a quite specific taste and I can imagine that not everyone appreciates it. I was lucky to try a home cooked version when I was invited by an Iranian family in Gazor Khan. Geymeh is a yellow split pea stew served with rice and fries. The best Geymeh I had in the bazaar in Esfahan. Qazvin has its own variety of Geymeh called Geymeh Nasser. This will be a highlight of your stay in Qazvin. The stew is enriched with cinnamon and orange peel slices, while the rice is topped with barberries, almonds and pistachios. Eggplants are widely available in Iran. Khorest e Bademjan is a stew with eggplants, beef and herbs. I am not a big fan of eggplants, but this stew surprised me. It is tasty and filling. If I hear Beryani I think about Indian rice, but Esfahan’s Beryani has nothing to do with this. Instead it is a dish made of minced sheep’s lungs and intestines. They serve the meat in a rolled bread with some fresh herbs. The bread and herbs were delicious, but the meat patty was greasy and had an interesting taste. It is very popular among Iranians and they will love it when a foreigner is trying it out. This rice dish is a speciality of Shiraz. It is rice with cabbage, herbs and meatballs. This dish is quite tasty due to the herbs. They serve it once a week in the Niayesh boutique hotel and I was happy I took the chance to try it. Another speciality from Shiraz is the Shirazi salad. It is really simple, but sometimes the simple things are the best. It’s a salad of cucumber, tomato, onion, mint and lime juice. I now make it often as a side salad at home. Persians love their tea and a cup of tea is never far away. Tea is often served with nabaat (sugar crystals on a stick) and ghand (sugar cubes). The iranians don’t mix the sugar cubes through their tea tough. They put it in their mouth between their teeth while taking sips from their tea. Doogh is a refreshing yoghurt drink similar to ayran in Turkey. The iranian version often has mint in it too and it is very popular throughout Iran. I loved the availability of fresh juice stands in most cities in Iran. Fresh orange juice and carrot juice are very popular, but my favourite was ab anar (pomegranate juice). Iran’s version of cola was made in the time of the sanctions when Coca Cola could not be imported. Persians have a sweet tooth and love their candies and cookies. If you have a sweet tooth too you will feel like you are in paradise. Bakhlava: The Yazd version of baklava using rose water syrup. Read more about Yazd in the best of Yazd: the gateway to Iran’s desert. Gaz is a nougat like sweet with pistachio’s or almonds. It was one of my favourite sweets in Iran. When I was in Nain I was invited inside a local gaz factory so I could see how it was made. The gaz I ended up buying here was absolutely delicious. Klucheh Fuman were another highlight in Iran. These walnut paste filled cookies are only available in Fuman. A small town where most people have to transit on their way to Masouleh. Don’t rush to get to your next bus or taxi, but stop here and find a bakery. Every bakery in town sells the round cookies. They taste best when still warm from the oven. Nan berenji are delicious rice flour cookies. Originally they come from Kermanshah and this is also where I tasted them. Every pastry shop in Kermanshah sells them. Soft icecream, but flavoured with saffron. Iran has a way of turning ordinary things into heavenly delicacies. I had saffron ice cream in Esfahan and Yazd, but couldn’t find it easily in other cities. Shiraz is famous for it’s icecream and faludeh. Especially faludeh is very popular among Shirazi’s. The noodles with sugar, rose water and lime juice are served semi frozen and make a perfect dessert after your lunch or dinner. This looks amazing!! I literally want to try everything on this list! Wow, this post is very comprehensive! You covered so many kinds of food in Iran and they all are very exotic and interesting to learn about! I must admit that I wouldn’t be able to bring myself to eat the dish made with sheep head, unless I was completely unaware what it was made of. What a detailed post! That childhood dinner must have really made an impression! Did you use a book or some source to find information about all of these dishes or did you have someone who could explain this all to you? I had never imagined kebab can have so many variations, and honestly, I have never hear of the rest, but pomegranate and walnut stew sounds like something I would like to try! I will be on a lookout for Iranian restaurants elsewhere, while I don’t yet have the chance to visit Iran! It’s very similar here in Egypt, it’s hard to find amazing Egyptian food that compares to good home cooked meals! Wow this looks so amazing- I want to eat everything! I love eggplant so the Khorest e Bademjan looks especially good. I am really keen to visit Iran and want to make it there this year. I have heard such amazing things about it. I think I might struggle a little with the food as I am vegetarian but there are a few items that you mention which I can try such as the Ash-e Shuli and the rice dishes (minus the meat). Being a vegetarian in Iran is not easy indeed, but yes, you can try asht-e Shuli,altough you will find it only in Yazd. Elsewhere you have asht-e reshteh. A delicious soup with beans and herbs and it is vegetarian !!. And then they make delicious stews of eggplants. most of them are without meat, but i am sure that if you ask they can guarantee you they make it without. Ask for Khorest-E-bademjan. i don’t eat meat in farsi = man gusht nemikhoram. This food looks amazing! Do you think a vegetarian could find good meals there? The food is amazing. I am not vegetarian so I havent really looked, but I think it could be done. Honestly, it will be tough, but Asht-e Reshteh is vegetarian. kuku sabzi is a vegetarian omelette and they have several different versions of delicious eggplant stew. This is why I want to go to Iran. I feel like I could eat endlessly for days there! I’m iranian i love your post it was so nice ! My favorite way to experience a country is through trying its local cuisine! I don’t think I’ve had any authentic Persian food but all of this looks fabulous. Amazing post! I love Persian cuisine and you really make me want to visit Iran now. What a comprehensive overview of Persian food. I’ve had Persian food in the Bay Area, California and recognize some of the dishes that you listed. My husband loves eating kebabs so it’s good to see the variety of kebab options. Do you know if the Khorest e Bademjan is available without the beef? I love eating eggplant dishes. The saffron ice cream sounds delicious too. i must admit that iran is not an easy country for vegetarians, but they have a lot of different eggplant dishes and I am sure they can make it without meat if you ask. I’ve had some Syrian food before but never Iranian. I love the look of the tea with the sugar stick in it. I used to just eat those sticks of sugar as a kid! I love travel for culture and food although sheeps’ heads and hooves, I’m not sure I could. Now Bakhlava is a different kettle of fish! Your blog is always so interesting and inspiring. Iran is on my list, hopefully will get their in 2021. Meanwhile I had not given much thought to the food. Wow! So amazing. Keeping this blog for reference in the future. I am a brave eater, and love to try new things (that are not too spicy) when we travel. Just about everything here looks and sounds great, except the Beryani. Like you, I though of the sweet Indian rice. I’m starving now and want to eat everything here. I love Persian cuisine and had a delicious meal in an Iranian restaurant in Oman not so long ago. Fascinating stuff – but a lot of it is much to sweet for me. If I ever get a chance to visit, I’ll have to print this off to help me find my way around the cuisine.